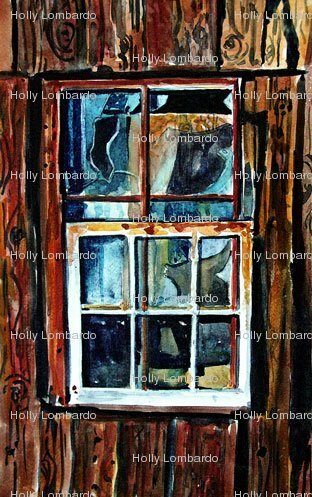 Windows are evocative objects. 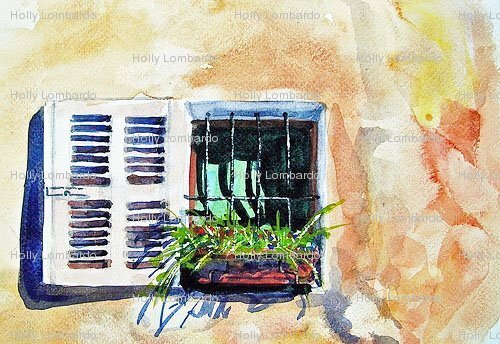 Without someone visible looking through, they can bring about feelings of loneliness and alienation — and that’s what Holly Lombardo’s windows do for me. They appear lonely, detached and abstracted from the whole of the house, and I reach for the perennial allegory of the individual versus the society to account for that impression. 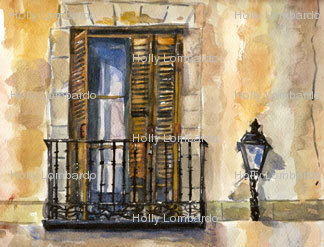 The window, the individual, is an inseparable part of the house, the society. It looks intriguing, but pitiful and lost at the same time. Yet there is a quality in the watercolors that disagrees with the suggested allegory. Suffused with air and sun, they convey delight, lightness and a bunch of other positive feelings . This cheerfulness flows from a different starting point, one that couldn’t coincide with that of the theme of loneliness. I think it is up to the viewer to resolve the arising conflict — and I actually believe that ignoring it may prove to be a good strategy. Instead of trying to reconcile the two ways of viewing, it’s possible to alternate between them, at the viewer’s whim. I like that flexibility, and I think that it speaks of the artist’s own. The singular theme would appear to exclude composition from playing a major part, but enter the colors and claim compositional territory. It is interesting that the rather pale colors end up serving the paintings in terms of space rather than light or palette — but perhaps not surprising. The windows are basically collections of geometrical forms – very fortunately arranged abstract pieces. The diffused colors, though provide thematic background, can be approached as geometrical additions dispersed in areas across the paper. This “color deconstruction” adds another dimension to the artwork. Perhaps it compensates for the inability to peek in and see what happens beyond the panes, the curtains and the reflections. Lines play an important, but underlying role. They criss-cross he windows yet somehow stay out of sight, bury themselves into the theme. I think that the lines add another dark aspect that works quietly against the sun and the light, and adds tension to the whole premise. Lines in such close disposition are bound to allude to prison bars and jails – allusions that elucidate the paintings from a completely different angle, and, in a way, put them to the test. By isolating a trivial everyday object the artist lays bare a series of emotions, associations and experiences that are nothing trivial, and all uneasy and complex.